The last and final under the wire deadline tag # 12!!!! WHEW! that was a ton of fun! 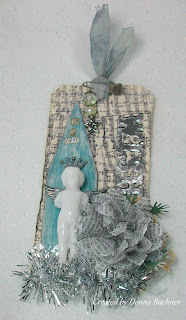 the first time that I have participated in doing Tim Holtz tags. I know that I want to do this next year. This tag was a challenge but at the same time fun for me. I did not have the tissue paper that Mr. Tim used I created my own by stamping on white tissue paper then gluing to the background and also used it in making the flower! also the silver on the word wish and at the lower bottom there is some silver edging. Once again I made another substitute. I did not have a 6 x 12 sheet of foil I used a roll of silver tape. I think it worked great. 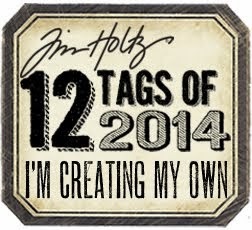 I hope that you have enjoyed the journey of my creating the 12 tags of Christmas. If there is any questions please ask. I also want to thank you all for the WONDERFUL comments! I loved reading them. Just a note to let you know where I get most of my supplies. It's just gorgeous, as are all the rest! Congrats on starting a blog as well...it's looks great! Welcome to creative blog land!!! Thank you Anita! I had a ton of fun. Welcome in Blogland, i am sure you love it. Great way to start 2012. Happy creative New Year! I am starting to enjoy this blogland :) and now have a great kick start to a creative New Year. Thank you Hetty and I wish you a Happy creative New Year! Great tags you have made here! Well done, the tags are incredible, now I want to make some. Happy New Year! This last one is ALSO striking, Donna!! I admire your ingenuity in devising substitute elements when needed. I hope that you feel a GREAT sense of accomplishment for you COMPLETED the challenge of making ALL TWELVE of tim's tags! !